Here’s where we will have pictures of everyone’s armies – as you post them on the site they’ll get added to your little section! The Flaming Spears are a splinter group from the Howling Griffons. During Abaddon the Despoiler’s 13th Black Crusade, murmurs of dissent arose among a group of battle-hungry Howling Griffons stationed at a remote outpost that expected a Chaos attack. When the attack materialized in a completely different area, the entire Company revolted, angry at being left out of the fight and ignored by the rest of the chapter. Wresting control of the warship Absentia from the Imperial Navy stationed with them, the revolutionaries flew towards the Eye of Terror, aiming to join battle in any way. For breaking their oaths, dishonoring the chapter and turning their backs on their brothers, the company members were branded traitors. The first group they came across were a company of the Chaos Space Marine Death Guard chapter, led by Typhus. Rather than fighting them, the leader of the traitorous Howling Griffons recognized he could use some new allies, and the newly-named Flaming Spears joined the forces of Chaos, in name if not in wholly in spirit. Since that time, the newly named Flaming Spears have fought side-by-side with the Death Guard in several campaigns, seeking to quench their thirst for battle and blood. Although some brothers have fallen, the Flaming Spears occasionally come across other forgotten, lost or disenfrancised Space Marines, who are always welcomed to join the fold. In addition to the Death Guard, other Chaos warbands periodically fight alongside the Flaming Spears as well, notably Khorne Berzerkers, but the Flaming Spears have yet to share the battle line with any members of the Word Bearers legion, with home the Howling Griffons maintain a long and ancient blood feud. It remains to be seen whether the traitors will forgive the feud or continue the fight. Not all of the Flaming Spears are fully invested in the Chaos gods, but a good number of the company have earned a high status with the Chaos Gods, and many show clear outward signs of the favors of Chaos. From the heart of Comorragh, the Dark City, comes an upstart crew of denizens looking to make a name for themselves. Using old and stolen vehicles, they strike from the webway, seeking to steal living beings to feed the insatiable hunger of the Dark Eldar for slaves and souls. A unique mix of gene-sequenced Scourges fights alongside Kabalite Warriors drawn from the ranks of Dark Eldar society, and ragtag Hellions fly over the heads of gladiator Wych cults who lust for more action than the fighting arenas can give them. Leading this rabble are a pair of Archons that squabble for power and political gain within the group. They need to be painted of course but in front is Eldrad, the famed Eldar Farseer (will play him as a normal Farseer most of the time I’m sure). To the right are Rangers/Pathfinders. Behind Eldrad are 10 Dire Avengers and their leader. Behind them are the infamous Warwalkers, in a squadron of three. Next to them is the Wave Serpent (turrent yet to be attached) which takes the Dire Avengers and Farseer around the battlefield. 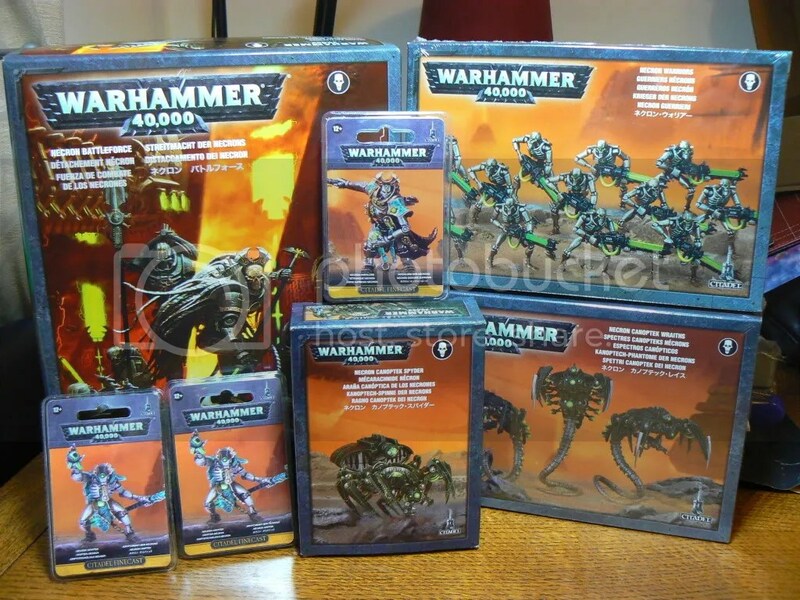 This will be the majority of my army, the only other troop type models I might get are another 5 terminators, 5 scouts and a couple of HQs. Other than this I’ll be saving the pennies for dreadnoughts, tanks, speeders and drop pods. Don’t think I’ll bother with bikes. Altogether I’m aiming for around 2500 points, making the whole army as flexible as possible. 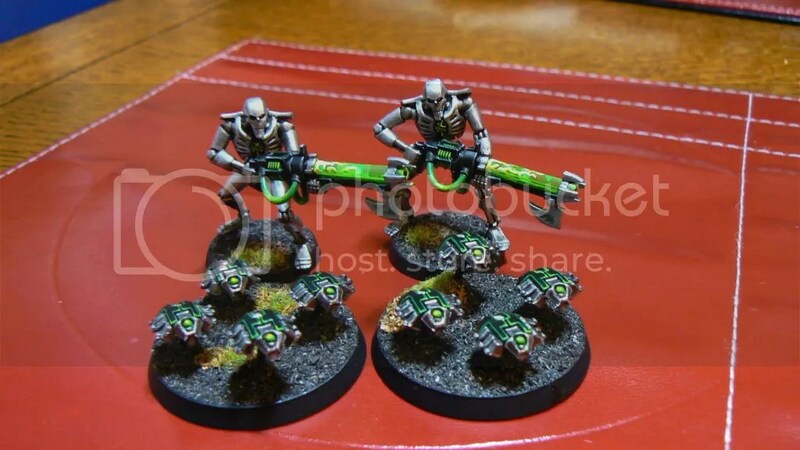 I will be painting my army a similar scheme to the Relictor chapter but playing from the BA codex most of the time. However, being Space Marines I might play from the Space Marine or other codexes from time to time to mix it up. Either as allies or just all one codex. They look like Aliens…they ARE aliens!